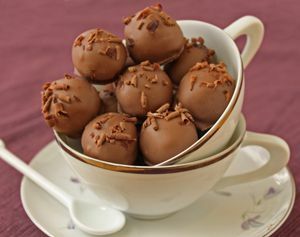 Cappuccino Truffles are a delicious way to get your caffeine fix! These smooth white chocolate truffles have a strong coffee flavor, miniature chunks of chocolate, and a coating of rich milk chocolate. If you'd like, you can replace the chocolate chips with your favorite chopped nuts, like pecans, walnuts, or almonds. 1. Place the chopped white chocolate or white chocolate chips in a microwave-safe bowl and microwave it until melted, stirring after every 30 seconds to prevent overheating. White chocolate scorches easily, so heat the chocolate slowly and carefully. 2. Combine the heavy cream, instant coffee, salt, and vanilla extract in a small saucepan over medium-high heat. Bring the cream to a simmer, but do not allow it to fully boil. 3. Once it is simmering, pour the hot cream over the melted white chocolate and whisk to combine. Once the cream and chocolate are completely combined and smooth, add the softened butter and whisk it in. Press a layer of cling wrap on top of the white chocolate mixture and let it sit at room temperature until it is completely cool. 4. When it is cool, stir in the miniature chocolate chips. If you add the chips while the ganache is still warm, they will start to melt and turn muddy, so make sure the ganache is not at all warm. Press cling wrap on top of the ganache and refrigerate it until it is firm enough to roll, about 3-4 hours. 5. Once firm, use a small candy scoop or two teaspoons to form the candy into small 1-inch balls. Roll them between your palms to get them entirely round, and dust your palms with cocoa powder if necessary if the truffles begin to stick. 6. Melt the chocolate candy coating in the microwave until it is smooth and free of lumps. Use dipping tools or a fork to dip the truffles in the melted coating, then set the dipped truffles on a foil-covered baking sheet. While the chocolate is still wet, sprinkle the tops of the truffles with chocolate shavings or sprinkles, if desired. 7. Let the candy coating set completely, then serve the truffles. Cappuccino Truffles can be stored in an airtight container in the refrigerator for up to two weeks. For the best taste and texture, let them come to room temperature before serving.